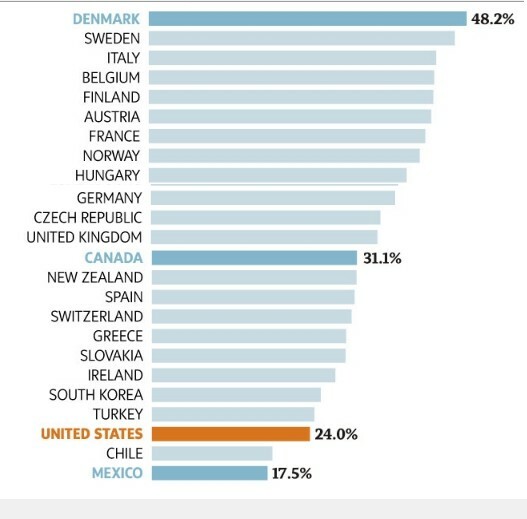 The following chart is a slightly shortened version of the one at The Globe and Mail, which demonstrates that US tax rates are among the lowest in the industrialized world. There is another chart at the Globe and Mail showing how US taxes have fallen since 1965. There is obviously no direct connection between low tax rates and a high rate of economic growth in various countries in 2011. Germany is doing well (maybe 3%), the US is doing poorly. Germany’s unemployment is 7%, lower than the US. The argument that raising taxes on the wealthy would hurt growth or employment holds no water. Moreover, not all eras are the same. With the challenge of global climate change, we are entering an era where government investment in green energy may have a huge downstream impact on future economic growth and well-being. Germany is making that investment. The US mostly is not. What you may be able to link low rates of taxation (and regressive taxation policy, which is what the US has) to is levels of social violence. Thus, Mexico and the United States are both extremely violent societies compared to those at the top of this list, in part because the government is starved by its stingy wealthy elites of funds to deal with violence, especially in poorer communities.